Viora Reaction offers patients one of the best new options for non-invasive cellulite reduction, skin tightening and overall body contouring! As we age, our body becomes depleted of vital skincare compounds like collagen and elastin. While collagen is responsible for our skin’s soft, supple feel, and youthful glow; elastin gives our skin its ability to “bounce back” and stay tight, while having a stretchy, elastic consistency. Without these vital compounds, our skin will begin to sag naturally due to things like weight fluctuations, and even gravity! The Viora Reaction system utilizes the one of a kind, CORE (Channeling Optimized RF Energy) technology system – delivering varying grades of RF (radiofrequency) energy into the treatment area, for the widest and most versatile body contouring coverage around today. How Does Viora Reaction Work? The versatile RF energy system utilizes a multi-channel mode that incorporates a number of different RF frequencies all at the same time! By doing this, the treatment is able to optimize the effects – reaching different tissue depths at the same time, providing the patient with maximum body contouring and skin tightening. This also allows us to treat all different areas of the body, and even the most sensitive areas of the face! When these RF energy rays reach specific depths, they are able to stimulate the production of these vital skincare compounds, collagen and elastin. 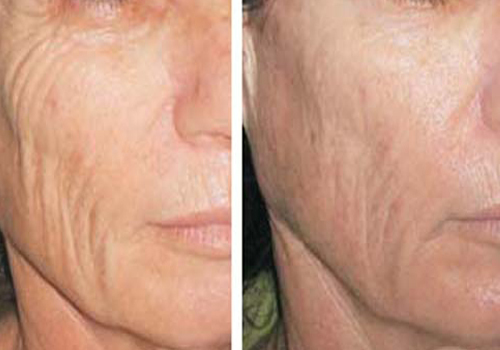 Leaving you with tighter, healthier, rejuvenated skim! Using 3 separate stages in a unique process, deep heating, mechanical massage and a mechanical stretch of the skin, the Viora Reaction system is able to completely change and contour the skin along the treatment area. Tightening, resurfacing, and removing unwanted cellulite, simultaneously! In addition, the system utilizes a special vaccum therapy process that helps penetrate the RF energy even deeper, increasing blood circulation. With increased circulation, results will be maximized and lead to the shrinkage of fat and cellulite cells. Where Can Viora Reaction Treatments be Used? Patients should see some mild benefits immediately following the treatment, however, results will peak at around 1-2 months. Depending upon the amount of correction needed and the patient, results will vary, and typically patients will require 6-8 sessions to achieve the best results. The Viora Reaction system is non-invasive, and doesn’t require the use of any surgery or needles, however some patients may experience some mild symptoms from time to time. Side effects include mild swelling, light redness, & bruising – however, these side effects will disappear within the first few days following treatment. For more information on the Viora Reaction system, and to find out if its right for you, schedule your consultation with New York Aesthetics today. Treated for: Cellulite and dimpled skin on buttocks. Protocol: 1 treatment per week, each session 20 minutes. Treatment results: Post 7 treatments, circumferential reduction of 3.5 cm from buttocks was recorded and measured. Reduction in cellulite volume also visible, rendering tighter, firmer skin. Treated for: Wrinkles and pigmentation at corner of eyes. Protocol: 2 treatments at 2 week intervals, each session 15 minutes. 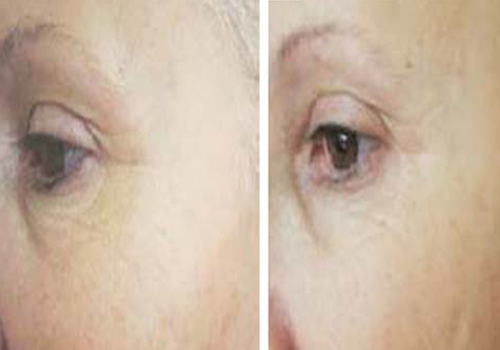 Treatment results: Post 4 treatments reduction in appearance of fine lines and wrinkles around eyes is visible. Collagen strengthened for visibly tighter skin. Treated for: Cellulite in the outer thighs and lower buttocks. Protocol: 1 treatment per week each session 30 minutes. Treatment results: Post 5 treatment sessions, reduction 1 cm in circumference and improved skin texture. Treated for: Lax, sagging skin around cheeks & folds at lower eyes. Protocol: 1 treatment at 3 week intervals, each session 25 minutes. Treatment results: Post 2 treatment sessions. Treated for: Dimpled and lax skin on the lower tummy region. Protocol: 1 treatment at 10 day intervals, each session 15 minutes. Treatment results: Post 3 treatments, skin is visibly tighten, lax skin has been smoothed out. Treated for: Excess fat at midtummy and waist region. 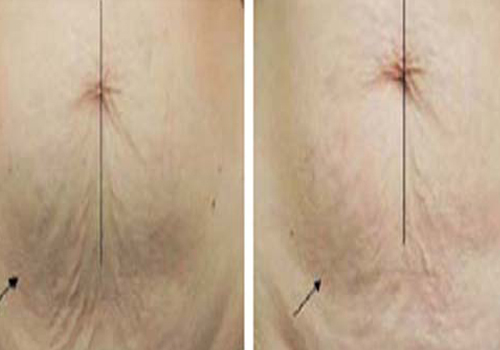 Treatment results: Post 7 treatments, circumferential reduction of 4.25 cm at the waist was measured and recorded. Treated for: Bulky and sagging skin in the underarm region. Protocol: 1 treatment per week each session 20 minutes. 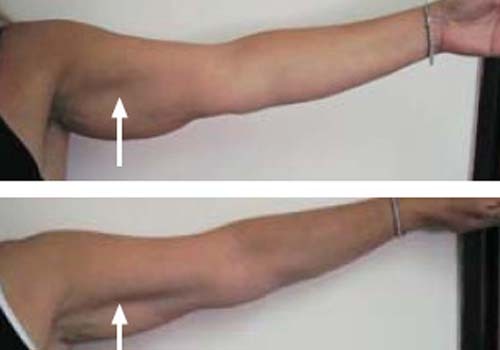 Treatment results: Post 3 treatment sessions, left arm reduction of 2 cm and right arm reduction of 2.5 cm. I’ve been a patient at New York Aesthetics for the last year now and this is definitely one of the best aesthetic spas’ in all of NYC. The staff is really sweet and kind, and they’re very well trained. I recently got my first vial of Botox performed earlier this week and they were very gentle, careful and precise – the injections barely hurt the way they did them. I am currently recovering from a PRP facial treatment and I’m already seeing outstanding results! I’m so excited and really owe so much thanks to the team at NY Aesthetics. They are so skillful with their work and even better than that they know exactly how to put their patients at ease. New York Aesthetics is the best cosmetic practice in the city, hands down! After every appointment, I always leave will a smile on my face, feeling like I got more than my money’s worth. They go above and beyond for clients and I’ve been all over Brooklyn and never gotten such a high level of aesthetic care before, anywhere! I heard about HCG from a magazine article years ago, so I was only a bit familiar when I came across this diet plan at Ny Aesthetics in BK. My wife really encouraged me to give it a try, since both she and I had been through a bunch of different crash diets and fad workout trends. And I’m really glad I took her advice! Its not like a magic potion or anything but it really helps you lose weight and stave off your hunger. The diet phase was very difficult at first, but thanks to the therapist at Ny Aesthetics I was able to push through and just keep going forward – they really know how to help you stay on you’re a-game. I dropped over 25lbs through the HCG weight loss program with them, the lowest I’ve weighed since my mid-20’s! Its been about 2 weeks now since my microneedling procedure at NY Aesthetics and I’m so excited to show off the results. My skin is looking so much more vibrant and healthier, with a nice shiny glow. And its getting to be smoother and smoother with each passing day, I really cant get over it. The procedure itself went well, the dermapen gave me a little pain with each penetrating cut, but it was very mild, and I barely felt it after a few seconds. With things already looking this good, I can’t wait to see the full extent of my results, in a weeks’ time! Never heard of Viora Refit before, but one of the ladies at NY aesthetics recommended I give it a try for skin tightening after my liposuction surgery last year. Once I had seen the results I just had to. My skin is completely snapped back, and its really looking great! I wasn’t ready to go back to my plastic surgeon so soon for my tummy tuck, and as much as he was pressuring me, I was way too nervous and didn’t want to spend the money on costly surgery. The Viora was perfect for me and my needs, the excess skin around my belly is like 90% gone and its healthy and still on the path to full recovery! For over a year now, I’ve been coming to New York aesthetics of by-monthly Juvéderm fillers, and I can’t get over how much better these guys are than any other practice I’ve ever been to. They’re safer, and more precise, my skin is never left red or itchy or irritated – a constant problem with getting fillers done from my previous estheticians. The team is here just seeming to be a bit more professional than any other ive come across throughout the city. My wife had gotten PRP done before, and she had okay results from a practice in Upper Manhattan. So, I was a bit weary about it, but when I finally agreed, something about the way they spoke to me and explained the process and went through the prep work – it just came off a lot more professional than the people my wife had gone to. While most cosmetic medical spas seem to be a bit unfocused and confusing as to their message, NYA came off professional and helpful the whole time – helping me through every step, making sure I knew what was happening and more. The best part of it all was that my results came out amazing and are still improving and this was probably at half the price. I had never heard of Hydrafacial before, so I asked a lot of questions when it was recommended to me for my acne and pore issues. After doing some research and getting some answers from their staff, the team at Ny Aesthetics educated me completely on the procedure. I decided to go through with it and was surprised by the great prices at this practice! No to mention its been a few days after, and I’m looking amazing. My skin is blemish & oil free, my pores are cleared and don’t look anywhere near as congested as they were before. All my dry skin is gone, looks much healthier and hydrated. Copyright © ​ NEW YORK AESTHETICS. All Rights Reserved.